Senior Taylor Budine has had a fulfilling academic journey. From her research with complex chemical compounds to her volunteer work with Dance Marathon and the Special Olympics, the environmental science and biology double major has left behind a great legacy at Florida State University. 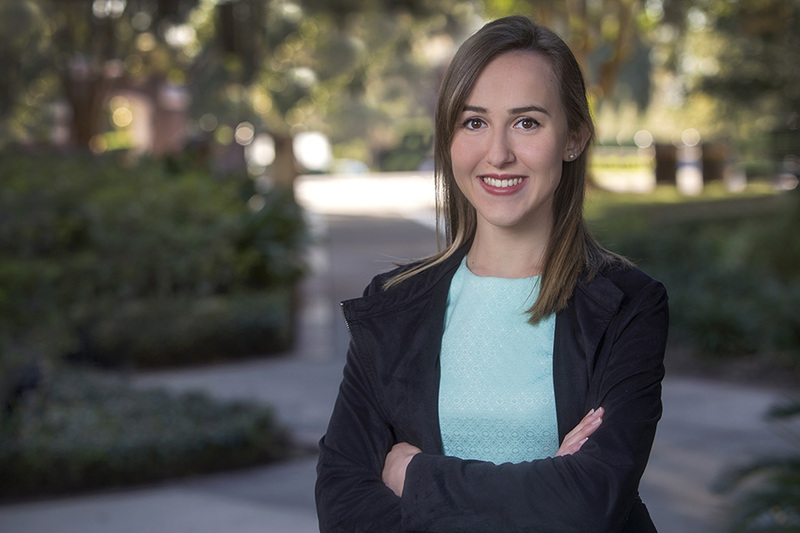 A native of Coral Springs, Florida, Budine was attracted to Florida State’s reputation as a preeminent research institution and looked forward to gaining hands-on experience with state-of-the-art research facilities and faculty. Budine’s decision to major in biology and environmental science was driven by the loss of her grandfather to cancer believed to be partially caused by environmental pollutants. His death led her to develop a deep interest in how the environment influences human health and well-being. She relentlessly pursued research, conducting studies in molecular biology to better understand how the environment influences health and causes the proliferation of certain diseases. She worked under Associate Professor of Biological Science Jonathan Dennis studying how DNA molecules are packaged in the nucleus of cells. Budine is currently working with Bisphenol-A, a chemical compound found in many plastics, to test how it affects chromatin structure and ultimately gene expression. This compound can lead to diseases, such as breast and prostate cancer and infertility by disrupting the endocrine system. She received a $1,000 IDEA Grant to conduct further research with Bisphenol-A and presented her work at the 2017 President’s Showcase for Undergraduate Research Excellence. She is currently expanding on this work for her honors thesis. In addition to her rigorous coursework and research in molecular biology, Budine has still found time to give back, volunteering hundreds of hours to community service and leadership positions on campus. She has participated on Dance Marathon at FSU for the past two years, served on the executive board in the Tri-beta Biological Honors Society, and she also works with the Special Olympics Tallahassee and Big Bend Homeless Shelter. “Florida State’s campus life is vibrant and dynamic and provides so many opportunities for engagement and service,” Budine said. Budine is grateful to have been involved in campus life at Florida State while still making dean’s list every semester. After graduation, Budine plans to continue her research in epigenetics and molecular biology while pursuing a doctoral degree. Her long-term career goal is to be a tenured professor.